BATON ROUGE — Several weeks ago, gay rights organizations announced a nationwide boycott of Chick-fil-A restaurants after the restaurant chain’s CEO said he favors traditional marriage. That led the newly-formed Chamber of Commerce of East Baton Rouge Parish to declare Wednesday, Aug. 1, 2012, as Chick-fil-A Appreciation Day in Baton Rouge. The result was an unprecedented outpouring of support for the five locally-owned Chick-fil-A stores. 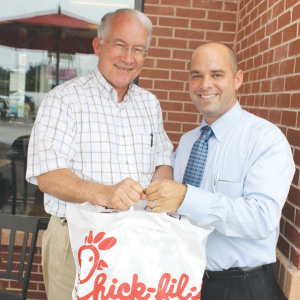 Bob Breaux, executive director of the Chamber of Commerce of East Baton Rouge (which is not affiliated with BRAC), said his members rallied to the aid of one of their fellow Chamber members, Brad Arton, who owns the Chick-fil-A store on College Drive. The Chamber EBR advertised on Facebook and took orders for nearly a week to help Arton’s business. The results were overwhelming, Breaux said. Instead of hurting the local stores’ business, they had record sales. At the College Drive store, lines were out the door, and the drive-thru had long lines of cars in the parking lot. Arton expressed thanks for the show of support for Chick-fil-A. Chamber of Commerce of East Baton Rouge was organized in May 2012 to help provide small business owners in the parish a voice to achieve their objectives. The Chamber holds a monthly luncheon Membership Meeting at 11:30 a.m. on the 4th Tuesday of the month. The Chamber will open its office soon at 7047 Jefferson Hwy., Suite A. For more information, contact Bob Breaux at 225-279-6008, email him at bob.breaux@gmail.com, or go to www.ChamberEBR.com.